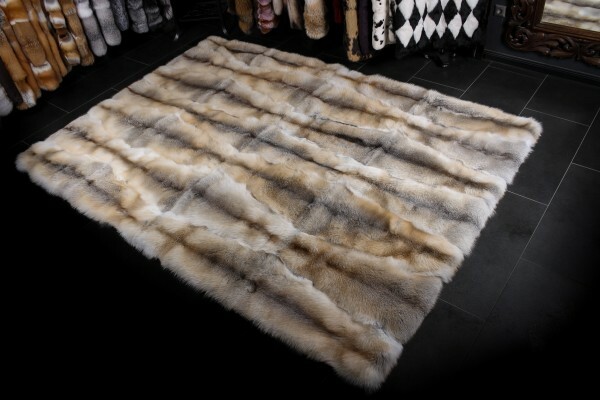 Beautiful fawnlight fur carpet crafted from the finest SAGA Fur fox pelts. The fawnlight fur carpet is exquisitely soft, offering unparalleled quality and luxury. The fawnlight foxes are from Scandinavia, bought from the prestigious SAGA Fur Auction in Helsinki. The fawnlight fox (alopex lagopus forma domestica) is among other foxes on of the famous Scandinavian foxes. The hair of the fawnlight fox is medium-long, very shiny and silky soft. The contrast of the darker back and the brighter shades are typical for the fawnlight fox. If you decide to purchase a fur product from Scandinavian fawnlight fox, you can be sure to get an elegant natural product from high-quality fox fur farms in Scandinavia. We produce fawnlight fox fur blankets, fur pillows, and fox accessories according to your wishes. If you have any questions regarding our fawnlight fox fur blankets, please do not hesitate to contact us. Related links to "Fawnlight Fur Carpet Natural Colored (SAGA Fur)"
Customer reviews for "Fawnlight Fur Carpet Natural Colored (SAGA Fur)"
Fur Cape Rabbit "Blue Vienna"